Every day in reading we explore vocabulary words. We complete many different activities to learn and review these words. One review activity is the Sticky Note game. In this activity, students choose a sticky note with a vocabulary word written on it. Without looking, they stick the word to their head. Other group members must give clues until each person knows what vocabulary word is written on the sticky note! In this photo, Devin is placing the sticky note on Trenton's head. Then, Trenton's group will give him clues about the word! Regan is receiving clues from her group. Another activity we use to practice vocabulary are fun flap books, also called "cootie catchers." 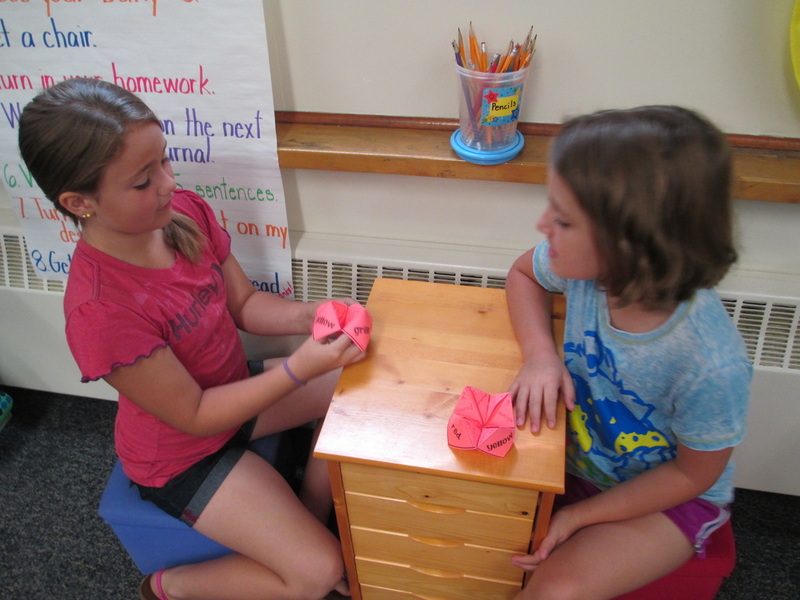 In this picture, Madison and Abi R. are practicing their vocabulary words. Eli and Gabby are also practicing their vocabulary. 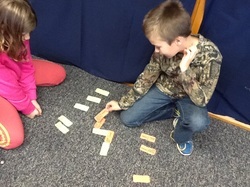 We often play Vocabulary Dominoes to review our words. Here Trenton and Regan are playing this fun vocabulary review game. Another vocabulary review game is called Mad Scientist. 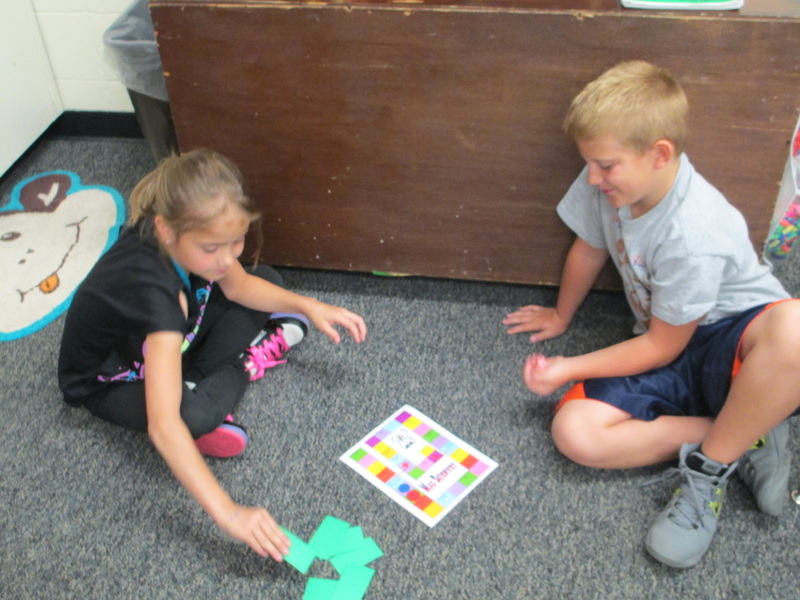 In this game, students practice their weekly words by playing a fun board game. Bailee and Max are enjoying this activity! Here we see Aubrey, Emma, and Laynie playing the game Talk Like a Pirate to practice using context clues. Using context clues, students use the sentence(s) around an unknown word to decode and understand what a word means. We work on reading comprehension every day in class too. Today's Meet is a type of classroom chatroom we use often for class discussions. Besides discussing the story using Today's Meet, students also blog about different ideas they have learned. You can find these entries in the "Student Work" section of this website. Here we see two students working together to discuss a blog question. They will write their blog entry together. Often, comprehension is broken down in comprehension skills. We also work a great deal on story elements. Here we created a chart of our ideas for the characters, setting, beginning, middle, and end of a story. Another comprehension skill we explore is fact and opinion. Here we are playing Fact and Opinion Football to help us understand this concept. ​Another comprehension skill we explore is cause and effect. Here we see Kaleal and Aubrey completing a cause and effect sort. We also played a giant game of cause and effect match as a class. Here Garrett is hoping to make a cause and effect match. Another comprehension skill we practice often is inferring. Here Aubrey and Trenton are reading a poem full of clues. They must use those clues to infer what object the poem is about. Everyone LOVED this activity! ​We often use pictures to infer too. 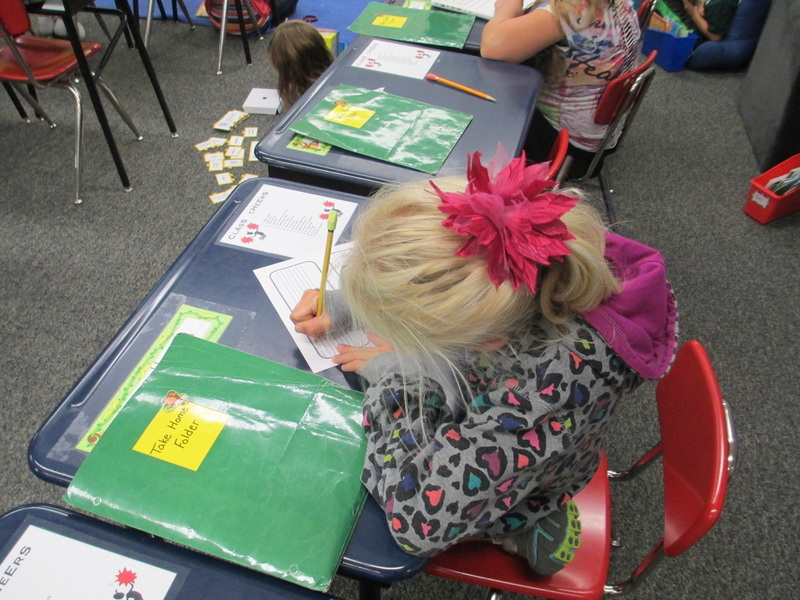 ​Students used a graphic organizer to help them infer. In this picture, Taylor and Regan are working together to infer using the graphic organizer. To practice comprehension skills and other reading skills in a fun, engaging way, we complete the Daily Five each day. During this time, students are able to choose one or two centers activities to complete. They also meet with me in a guided reading or reading skills group. Finally, they complete read to self. 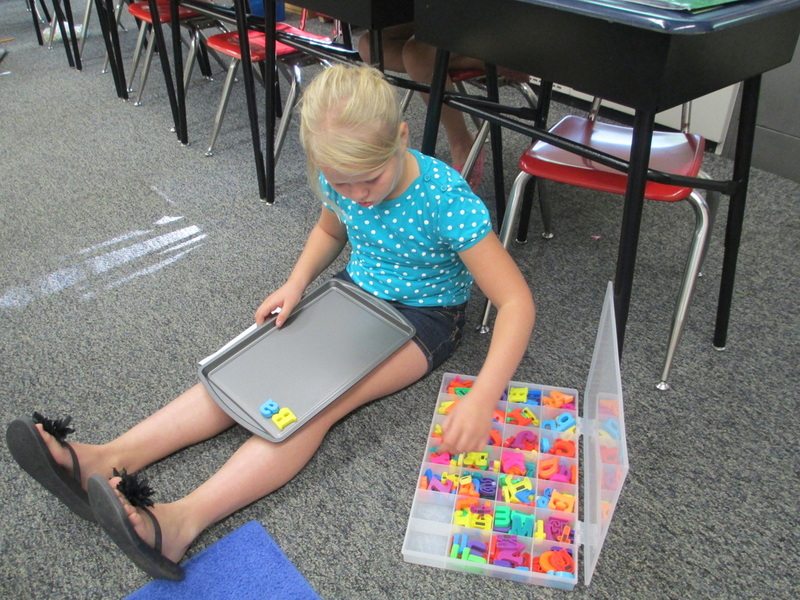 Here Arynn is working on a spelling activity. During Daily Five we also complete fluency activities. Here Maddi is practicing reading a story into a toobaloo. Next, she will record herself reading the same story. Finally, she will be listening to herself read and evaluating her fluency. 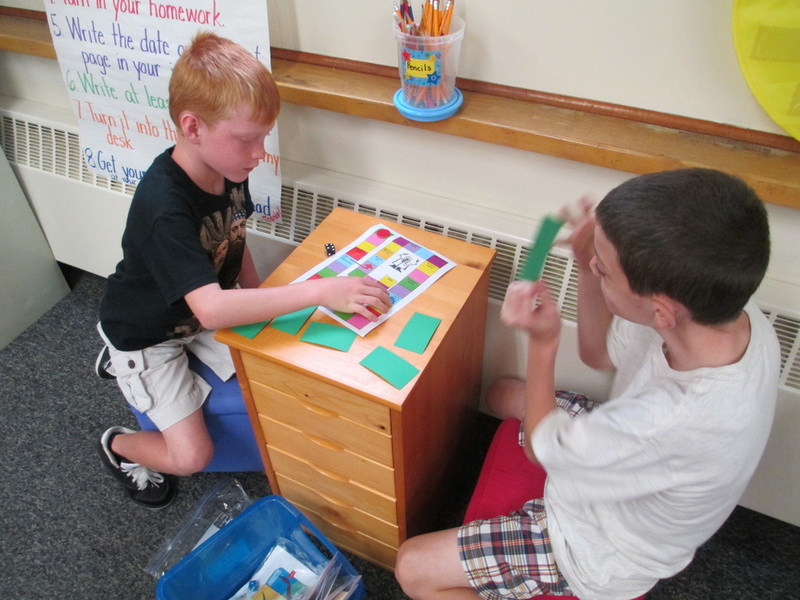 During this time, students also play partner games to review vocabulary concepts. Leggy and Carter are playing these games. Here students are listening to stories online. This is another fluency activity completed during Daily Five. Morgan is completing Working on Writing, which is another activity students can choose to complete during Daily Five time. 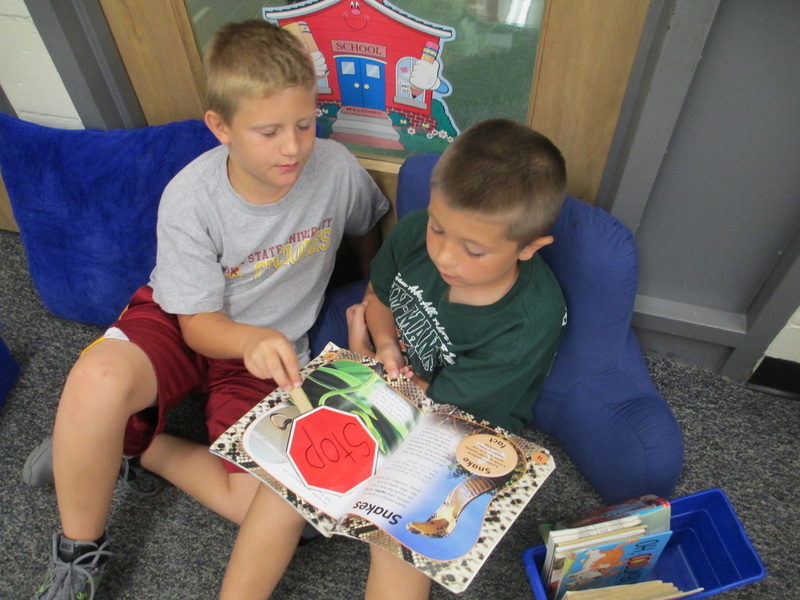 Max and Cooper are completing Partner Reading. They are using a stop sign to stop and check for comprehension while working. Another activity we like to complete is a 1 minute celebration, Each student gets an instrument and celebrates by playing the instrument for 1 minute. We often get to celebrate accomplishments in reading. 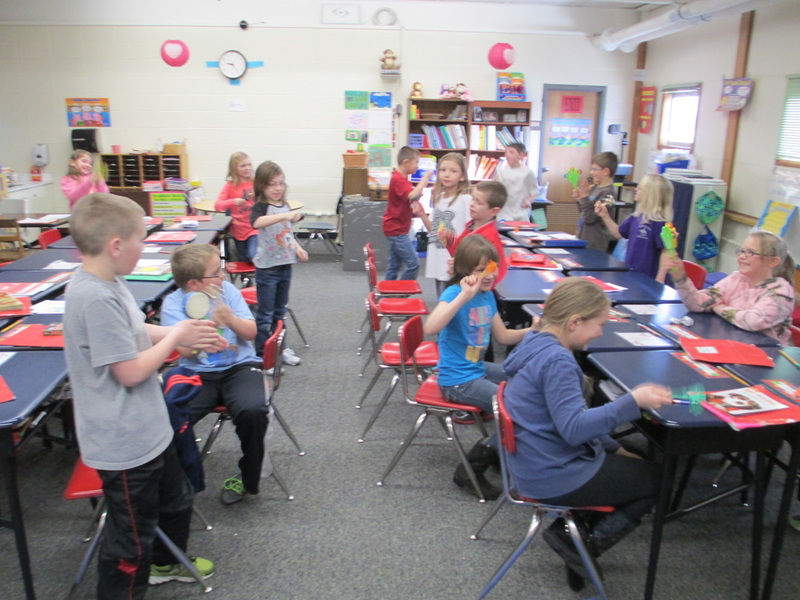 In this picture we can see the class playing their instruments during a 1 minute celebration.